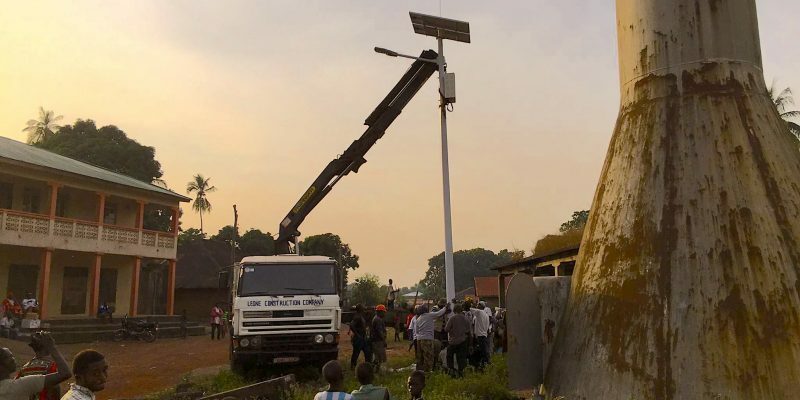 According to the Sierra Leonean press, Akon, a Senegalese rapper living in the United States of America, has promised to provide 5,000 street lamps and 2,500 solar-powered traffic lights for several cities in the country. The decision is part of his "Akon Lighting Africa" project. “Akon Lighting Africa” is on the move with an objective “to democratise access to solar energy in Africa”. In the sidelines of the United Nations (UN) General Assembly, held in September 2018 in New York, Senegalese rapper Akon met with Sierra Leone’s President Julius Maada Bio. The two personalities had an interview at the end of which they agreed. The rapper, who is based in the United States of America, has promised to provide 5,000 streetlights and 2,500 traffic lights to several cities in Sierra Leone. Yusuf Keketoma, the spokesman for the presidency, welcomed it in the following terms: “The commitment of Akon’s philanthropic organisation will be a great help for the electrification of our country. It proves the leadership of President Julius Maada Bio, who, in six months, has mobilised international goodwill to improve the daily lives of Sierra Leoneans. “In fact, the president (Julius Maada Bio) inspired me a lot. Meeting young elected African leaders is very motivating because my biggest challenge is to get them to share my vision of Africa. With him, we speak the same language. We have a similar way of thinking. And I feel that he will do things for Sierra Leone,” Akon said. The rapper has been working for a long time to develop Africa’s solar potential. That is why in 2014, with activist Thione Niang and entrepreneur Samba Bathily (founder of Africa Development Solutions (ADS) and CEO of Solektra International), he launched the “Akon Lighting Africa” project. His goal was to install solar streetlights and small off-grid systems. The programme targets 14 countries, including Guinea, Senegal, Mali, Niger, Benin and Sierra Leone and it is not the only Akon project in Africa. After having made his country benefit from the “Akon Lighting Africa” project, he set himself the ambition of building a real “Wakanda” in Senegal with a virtual currency called Akoin. It is inspired by an imaginary smart city in which the story told by Marvel’s Black Panther takes place. While the project remains very utopian for the moment, its website indicates that the President of Senegal Macky Sall has offered 2,000 hectares for the construction of this city, which will run 100% on renewable energies….